There’s little better than a bowl of hot soup on a cool evening. 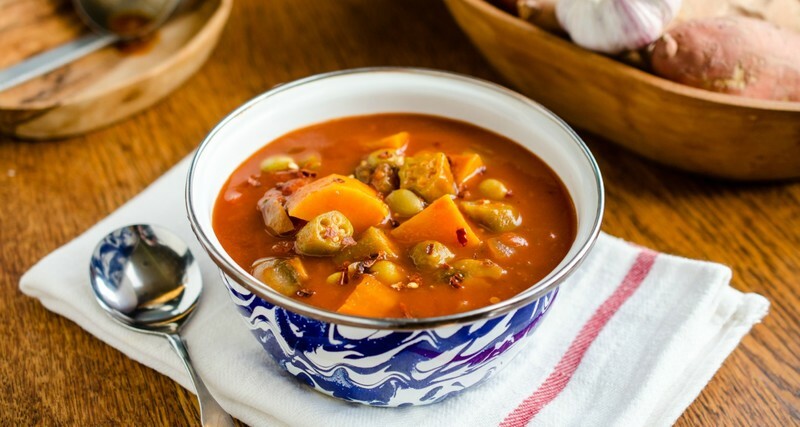 In this month's entertaining column from renowned cookbook author Virginia Willis, learn how to turn soup-making into a party with plenty of leftovers to feed your family. It’s a cold, grey and rainy fall evening at the end of a very long day, and you’re on your way home from work in a sea of angry red brake lights. Your windshield wipers are dragging across the glass, thudding — b-lump, b-lump, b-lump. (Didn’t you just have them fixed last month?) Traffic is an absolute bear. Your stomach growls and all of a sudden it seems like lunch was a million years ago. Ah, yes. Dinner. The most dreaded question of any busy weeknight — “What’s for dinner?”— screams through your mind. You don’t want to stop at the store and you know the fridge is empty, save for a bottle of wine, a collection of condiments and the bare essentials. “Ah, wine, I want a glass of wine,” you think. ... Ok, wait, dinner. We have to eat dinner. Stay focused. You ponder, “Hmm…we could order Chinese? Pizza?” You already know the answer. Even if you actually wanted bland, mediocre delivery you know it will take absolutely forever because, well, it’s a cold, grey and rainy fall evening, and traffic is bad. Your stomach grumbles. A sheet of rain pounds the roof of your car. The dual combination of misery and soul-withering despair starts to tighten their icy grip — b-lump, b-lump, b-lump. Then, you gasp. Slowly you begin to smile. You remember you have a collection of ready-to-go homemade soups to choose from in the freezer. Despair begins to slink away. In your mind you can see a bowls of steaming hot soup and your joyful family, happy and laughing around the dining room table. Suddenly, your lane opens up, red lights transfigure to gleaming white, the rain stops, and the skies clear. Ok, so maybe it won’t quite play out like that, but I know I’ve been in a very similar situation. I keep a soup in the freezer for days just like what I’ve described. 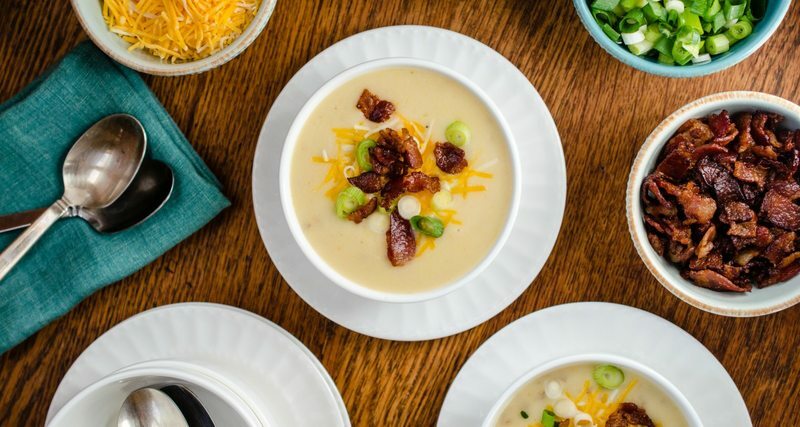 One great way to fill your freezer with soup is to make it into a party — a soup swap party. The premise behind a soup swap is that you invite some friends to come together and bring several containers of soup to share. Then you taste and swap, and everyone goes home with different soup than what they brought. It is a great way to bring people together to have a little fun and fill the freezer. The more folks you invite, the greater the variety, ultimately meaning more soup for everyone to take home. Is your first thought accompanied by an eye roll? “Well, Virginia, if I had time to cook soup all day I wouldn’t need to host a soup swap.” Don’t worry. I’ve got you covered with a trio of classic Southern soups that I’ve tweaked just a tad to help with the workload. 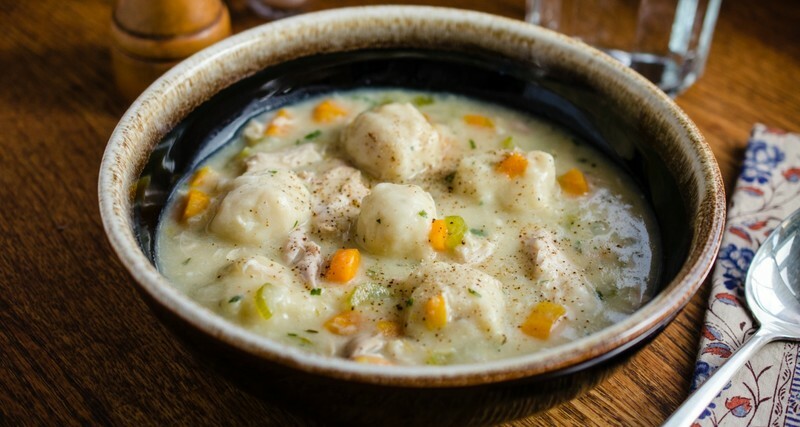 My quick herb chicken and dumplings is Southern comfort in a bowl, made with an easy drop dumpling dough and a rotisserie chicken. My vegan vegetarian soup doesn't require hours of simmering ham bones or pots of homemade vegetable stock. It is what is ingloriously referred to in the parlance of food writers as a “dump-and-stir” — but it is absolutely packed with flavor. (The secret is a shot of umami-packed miso.) Lastly, my homemade baked potato soup can be ready in less than 30 minutes without resorting to cans of salt-laden "cream of" soups, copious amounts of heavy cream, or bags of ready-made hashbrowns. Throw in an array of toppings, such as scallions, bacon, and cheese, to allow everyone to customize. These three great homemade soups below are quick and easy, and made with healthy, wholesome ingredients. In fact, they might all be too good to giveaway! In a large, heavy-bottomed pot, heat the oil over medium heat. Add the onion, carrot and celery, season with salt and pepper, and cook, stirring occasionally, until the vegetables begin to soften, 5 to 7 minutes. Add the garlic and cook until fragrant, 45 to 60 seconds. Sprinkle the flour over the vegetables and cook, stirring, for 2 minutes. Gradually whisk in the stock, followed by the milk. Add the potatoes, increase the heat to high and bring the soup to a boil. Reduce the heat to low and simmer until the potatoes are tender, about 20 minutes. Add the cheese, a little at a time, stirring until melted and smooth after each addition. Taste and adjust for seasoning with salt and pepper. Purée the soup with an immersion blender. Leave it coarse for a more rustic soup, or purée it until smooth for a more elegant result. To serve, ladle the soup into warmed bowls. Serve with the toppings on the side. In a large bowl, combine the flour, cheese, baking powder and 3/4 teaspoon of salt. In a small saucepan, bring the milk and butter to a simmer over low heat; season with pepper. (Alternatively, zap the milk and butter in a glass measuring cup in the microwave until the butter is melted.) Add the milk mixture to the dry ingredients and, using a rubber spatula, stir to combine. Heads up: The mixture will be pretty dry. In a large saucepan, heat the oil over medium heat. Add the onion, carrots and celery. Cook until the onions are translucent, 3 to 5 minutes. Add the garlic and cook until fragrant, 45 to 60 seconds. Add the stock and bring to a boil over high heat. Reduce the heat to low. Using a small ice cream scoop or tablespoon, drop the dough, about 1 tablespoon at a time, into the simmering stock. Cover and simmer until the dumplings are cooked through and the vegetables are tender, about 20 minutes. To assemble, add the chicken and continue to cook until just heated through, about 5 minutes. Stir in the parsley. Taste and adjust for seasoning with salt and pepper. Serve immediately. In a large, heavy-bottomed pot, heat the oil over medium-high heat. Add the mushrooms, onion, carrots and celery. Season with salt and pepper and cook until the onion is soft and translucent, 3 to 5 minutes. Add the garlic and cook until fragrant, 45 to 60 seconds. Add the vegetable juice, tomatoes, miso, bay leaves and thyme. Stir to combine. Add the butterbeans and sweet potatoes. Bring to a boil over high heat. Reduce the heat to a simmer. Cook until the vegetables are just tender, about 15 minutes. Stir in the okra and continue to cook until tender, about 5 minutes. Stir in the pepper flakes and season to taste with salt and pepper. Ladle into warm bowls and serve immediately. Georgia-born, French-trained chef and food writer Virginia Willis has made cookies with Dwanye “The Rock” Johnson, catered a bowling party for Jane Fonda, foraged for herbs in the Alps, and harvested capers in the shadow of a smoldering volcano in Sicily — but it all started in her grandmother’s country kitchen. Her legion of fans loves her knack for giving classic French cooking a down-home feel and re-imagining Southern recipes en Français. Virginia's newest cookbook, "Secrets of the Southern Table," is currently available for here. Her previous book, "Lighten Up, Y’all: Classic Southern Recipes Made Healthy and Wholesome," received a 2016 James Beard Foundation Award of Excellence. Learn more about Virginia and follow her culinary exploits at VirginiaWillis.com.